Charities almost never have good evidence that what they want to spend money on is better than what poor people would choose to spend the money on if they just got the cash themselves. I certainly don’t trust myself to know what the world’s poorest people need most. I’ve been profoundly lucky to never experience the kind of extreme poverty that billions of people worldwide have to endure. I have no idea what I would spend a cash transfer from GiveDirectly on if I were in Jacklin’s shoes. Would I spend it on school fees? Maybe! Or maybe I’d use it to supplement my food budget. Or save for a new house. I really don’t know. You know who does have a good sense of the needs of poor people like Jacklin? Poor people like Jacklin. They have a very good idea of what they need. And you should only give something other than cash if you are confident you know the recipients’ needs better than they do. Washington Post: Laziness Isn’t Why People Are Poor. And IPhones Aren’t Why They Lack Health Care. But what if someone uses the money for, say, a glass of wine? (A perfectly Milanese question.) His answer: If “a glass of wine is the only happiness he has in life, that’s O.K. Instead, ask yourself, what do you do on the sly? What ‘happiness’ do you seek in secret?” Another way to look at it, he said, is to recognize how you are the “luckier” one, with a home, a spouse and children, and then ask why your responsibility to help should be pushed onto someone else. As Rev. Cooper points out, many young people leave the church when they graduate from high school and never look back. She cites a figure of forty to fifty percent and, frankly, I wouldn’t be surprised if it was higher. And while a lot of people are asking how we can bring those people back to the church – and that’s a good question to be asking – Rev. Cooper has a different question: why did they leave in the first place? There’s an important story here. Fifty years ago – maybe less depending on the church, culture, and geography – many church activities were intergenerational. Children and youth were in worship, parents brought their kids to meetings, and so on. There were Sunday School classes, confirmation classes, youth groups, and other activities focused on children and youth. But those were in addition to the intergenerational activities that formed the core of the experience of the church community. Children and youth were part of the community. This had its problems. Those intergenerational activities weren’t created or managed with children and youth in mind. So while children and youth were there, they weren’t included. So we did something about this, we invested resources in children’s and youth ministries. We created more ministries – and expanded existing ministries – that were focused on faith formation in children and youth. That was a good thing. But we created and expanded those ministries largely through segregation: Sunday School and children’s church and youth groups and so on happening at the same time as ‘adult’ activities. For example, a congregation might have a suite of activities for children and youth that happen at the same time as Sunday morning worship… keeping those children and youth out of worship. The first time those young people experience traditional worship is when their confirmation class ‘visits’ their own church! The second time might be when that same class leads a service they’ve only seen once. Then it’s on to sporadic attendance and leadership, for example, after a mission trip. Most of the time, those youth are back to activities that take place at the same time – but outside of – ‘traditional’ worship. Children and youth build their church community in children’s church, youth groups, and the other ministries that we’ve designed for them. There’s a good side to this. These ministries are focused on teaching, caring for, and working with young people. They have a community where they’re included. But there’s also a bad side. When young people graduate from high school, they suddenly become adults and we suddenly expect them to participate in ‘real’ church. The community that they had isn’t there anymore, and they’re thrown into a new community where they still aren’t exactly included. And then we wonder why they don’t come to a church they’ve never known. So, what do we do? 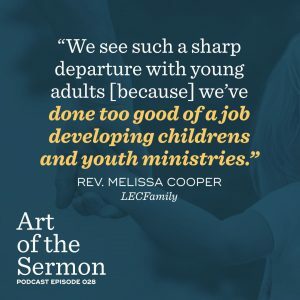 How do we help young people not leave the church? Or, better, how do we keep the church from leaving young people? The answer is both simple and complicated. Ministries segregated by age aren’t bad. Ministries designed to be developmentally appropriate aren’t bad. But they need to be balanced with intergenerational ministries. We need to reverse the trend. Age-segregated ministries shouldn’t be normal; intergenerational ministries shouldn’t be special. Instead, intergenerational ministries should be normal; age-segregated ministries should be special. People of every age should be part of the ministry of the church, from serving on the church council to reading scripture to being an acolyte. By including people of all ages in the life of the church – by limiting the segregation of age-based ministry – we can help young people be part of the whole church. As they age, they will find new ways to be members of the whole church, instead of seeing their church disappear as they age out of youth group. Intergenerational ministry is the future of the church because it helps young people be the present of the church. Here I am writing an essay pointing out that racism is bad. This is kindergarten material. We should not have to have these conversations. Our national media’s instinct to normalize whatever is happening among the politically powerful is so strong that they are now writing stories giving positive reviews to a speech in which the president just proposed one of the most baldly racist official government actions that I can remember. The fact that he stuck to the teleprompter does not balance this out. The fact that he did not insult the media as much as usual does not balance this out. The fact that a widow cried does not balance this out. This sort of determined, poisonous persecution of a minority group is not just one more factor to be weighed for its public relations value. Nothing balances this out. Go ask an immigrant how presidential Donald Trump seemed last night. Ultimately, I must respectfully disagree with Rev. Lindsey. We in the UCC do NOT face a crisis of diminishing pastoral leadership. We have a crisis of diminishing congregational opportunities for clergy, as well as a diminished capacity for clergy to be compensated appropriately for the work they do. HOWEVER, we also have an exploding opportunity for ministry beyond the traditional walls of the “church,” and we have strong and faithful clergy who serve part-time or bi-vocationally no matter their age. The UCC is on a leading edge for what ministry might look like in the 21st century.